While the thought of running on a treadmill may sound dreadful, there are a few ways you can mix it up a bit to make the time go by faster and make your run a bit more exciting. Interval workouts are a type of training involving alternating between high- and low-intensity speeds with some rest periods in between the more intense periods. Varying the intensity of your run helps to exercise the heart muscle, which gives you a better cardiovascular workout and improves your aerobic capacity. This gives you more stamina during your run and allows you to run faster. The key here is to help yourself imagine that you are actually running outside. While you can’t completely replicate running outdoors, sometimes the weather gets in the way so you have to make the best of it. Whether you are a beginner or an advanced runner, there are some great interval runs that will keep you entertained. If you are just beginning to love running, it is important to ease into your practice in order to give your body some time to get used to the physical demands of running. This will prevent you from getting sore muscles, making you want to quit. Switching up walking with running is an effective way to raise your heart rate while also getting your body ready for speed and distance. 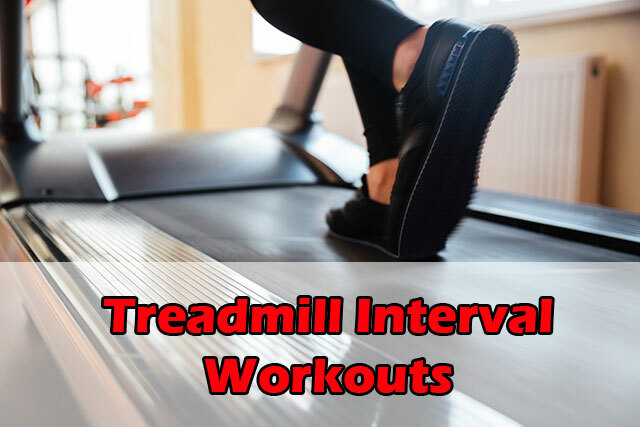 Here is a treadmill interval workout for beginners that takes 40 minutes to complete. If this schedule is either too hard or easy, decrease or increase the speed as needed. As a beginner, it is a good idea to keep the incline at 1.0 to prevent developing shin splints, which is a common problem for people who are new to running. Do this workout three times in your first week, and then in your second week after your warm-up, alternate running and walking for three minutes each, then cool down with just walking. This advanced interval training treadmill workout can be modified if you are not quite at this level yet. The best thing about this workout is that it only takes 20-25 minutes, with only 12 minutes of that being intense exercise. The workout progresses gradually, so there is a warm up prior to the intense interval training. Adjust the speeds and the inclines and necessary, just make certain that you are always challenging yourself.